Market stalls stand empty of customers on Wednesday. Slow weekly business, non-functioning toilets, poor protection from rain, lack of proper garbage disposal facilities, and a lack of security are among concerns raised by vendors at the temporary market facility at Shaw Park, based on their occupation there since May 22. The vendors were relocated to the facility to allow for upgrade works to the Scarborough Market on Wilson Road in the heart of the town. 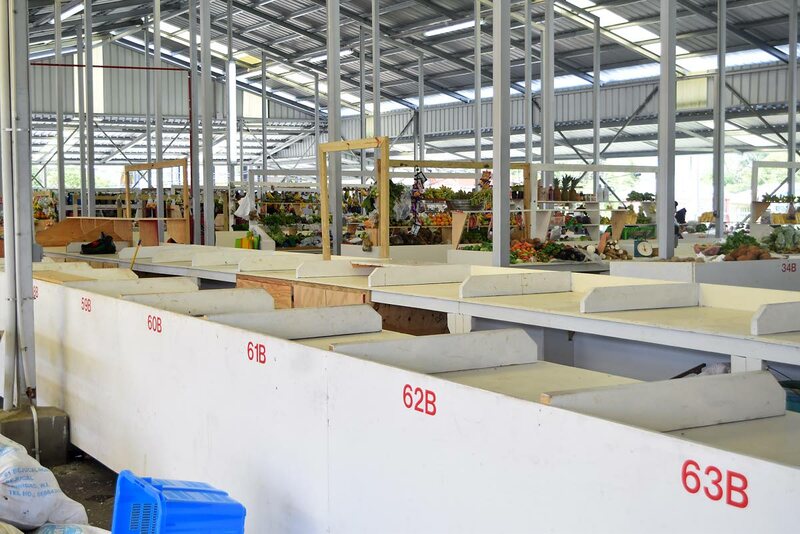 During a visit by Newsday Tobago to the facility on Wednesday, one vendor, asked about the slow pace of business with barely any customers about, said this was a daily situation, and that the market only came alive on weekends for them to make any sales. She said since the relocation to the Shaw Park site, sales have been very dismal for vendors. Member of the Vendors’ Association and a vendor at the market, Lutchman Persad, also noting the poor sales for vendors, said this was a concern raised prior to the relocation, and assurances were given that the Division of Food Production would implement strategies to attract customers. “The Marketing Department said PTSC (Public Transport Service Corporation) would provide a shuttle service for vendors and customers likewise to get to and from Scarborough. We are yet to see that happening,” Persad told Newsday Tobago. “The problem is that the vendors are now unable to enjoy the walk-in customers during the week as we used to in Scarborough, but if a customer knows that they want to spend $10 to $20 during the week and they have a free service to come to Shaw Park with the shuttle, they will be more come to Shaw Park and spend their money. But if they are to spend this $10 to $20 and pay transportation, they may more opt to come on weekends as they do now,” he said. Persad raised other concerns by vendors. “Over at the container area that houses food vendors, the toilet areas and even the office, the aisle is uncovered, it needs to be covered. “On the opposite side, the area by the road, when the rain falls, its blows in,” he said, suggesting that the roof be extended to help alleviate this problem. He also noted that at the delivery offload area, the driveway only allows for one vehicle at a time, which was quite inconvenient, a problem that could be remedied by widening the area. Persad also noted a shortage of garbage bins in and around the vending area and at stalls. “The vendors are putting their refuse in boxes and because of the breeze, from time to time, the rubbish will blow away and it makes the place looks very untidy. The bins on the outside are an eyesore, and while we don’t have a rat problem just yet, we don’t want to encourage that, we want to get rid of that from the onset,” he said. He also said attention should be paid to unpaved areas of the carpark and a non-functional toilet as well as improved security for the market. “We think that the carpark needs to be fenced, especially coming up to the Christmas period. The area, how it is located, you really don’t want to encourage anyone to think about robbing people outside there. Even though they have police on patrol, we would like to keep the chances of getting rob outside there slim. Lighting is already a challenge,” he said. Persad said he has raised these concerns raised with relevant persons in authority, but was yet to see any action taken or get any positive responses. Attempts to contact Secretary of Food Production Hayden Spencer for comment were futile as all calls to his cellphone went unanswered. Reply to "Shaw Park vendors complain of poor sales, infrastruture issues"